Literature has a certain melody to Ashok Ferrey, who is able to sense its harmony. Outstanding Personalities features, insightful, humorous, talented and charming Ashok Ferrey who is one of Sri Lanka’s best loved authors. Ashok is a personality who still remains very much down to earth despite his great success in the field of literature. Q: You were born in Sri Lanka, raised in East Africa and educated at a Benedictine monastery. Do you feel that all of this has contributed to the unique quality of magnetism you have within you - magnetism that has enabled you to be short listed for the Gratiaen Prize 2003 for your book Colpetty People? A: It has certainly contributed towards the confusion! I was just doing an interview for writersmelon.com where I was asked what aspect that defines you? And it is nothing. I still don’t know what I really want to do or what I am! I think we all have a duty to have a go at things. If you think you are able in some way to do something, you have a duty to explore that. Most people don’t get that chance because when you are in a regular job you might not have time to explore. At the end of our life you might be quite successful but the world has lost a good artiste. So I generally feel you must be foolish enough to try different things. This variety of things I have done has contributed one thing. I think it is relatively easy for me to find material for my writing. There is almost too much material. Those things quite often have really happened to me. I have observed them in other people. In my books there are so many absurd situations and characters but many of those are drawn from real life. Many of the other writers are much younger than me with little experience. So they have to really search around for characterization. For me it is quite easy because I suppose during my life I have been observing people unconsciously without realizing. I am generally quite a shy person and I don’t interact with other people. Now having become a writer I have almost been forced to interact with people. That is not to say I am not interested in people. I am hugely interested in people. But I watch and listen. Someone will make one little comment which will give away his entire personality. But he won’t necessarily make that overtly. It would be almost by accident. And I am good at picking up those things. It is a sort of inquisitiveness on my part and an eye for weirdness. On one hand I am a Modaya but on the other hand I am a real cynic. So you realize that everyone is presenting some kind of face. And as I get older I realize that nobody is really that good. We are not that bad, but we are not that good. In fact in my latest novel which will come out in December, I deal with good and bad. Now I realize it is not black and white. You take the biggest mass murderer and he will have redeeming qualities. You take the biggest saint, he or she will have bad qualities. Q: How has this multi-talentedness of yours been nurtured? You seem to have so many sides to you. You have a flair for people and you read pure maths at Christ Church Oxford? A: I think it is this quality of foolishness. You have to be a little foolish. Sometimes you can be too clever for your own good. You can say – ‘oh I will never be good at that!’’ forget it! it is too difficult!’ so you will never achieve anything. But whereas if you are a really Modaya you would say – ‘I can do it! oh let me try!’. I have written five books and been short listed by the Gratiaen for four of them. And the fifth book I wrote was shortlisted for the State Literary Award. I have never won anything. I am filming a TV Show – Art and Architecture with Ashok. My latest book is just about to come out called The Ceaseless Chatter of Demons. It is about evil and good. Nowadays terms like good and evil are old fashioned terms. Because people find a way of excusing anything. If I commit six murders there would always be someone in the world, a psychologist or psychiatrist who will defend me. They would make excuses saying – he was abused as a child. People will always find a reason to excuse evil. I am exploring the fact that some people are gratuitously evil, without anything causing it! Q: You seem to be able to argue the subtleties in life fluently and in a rich vein. 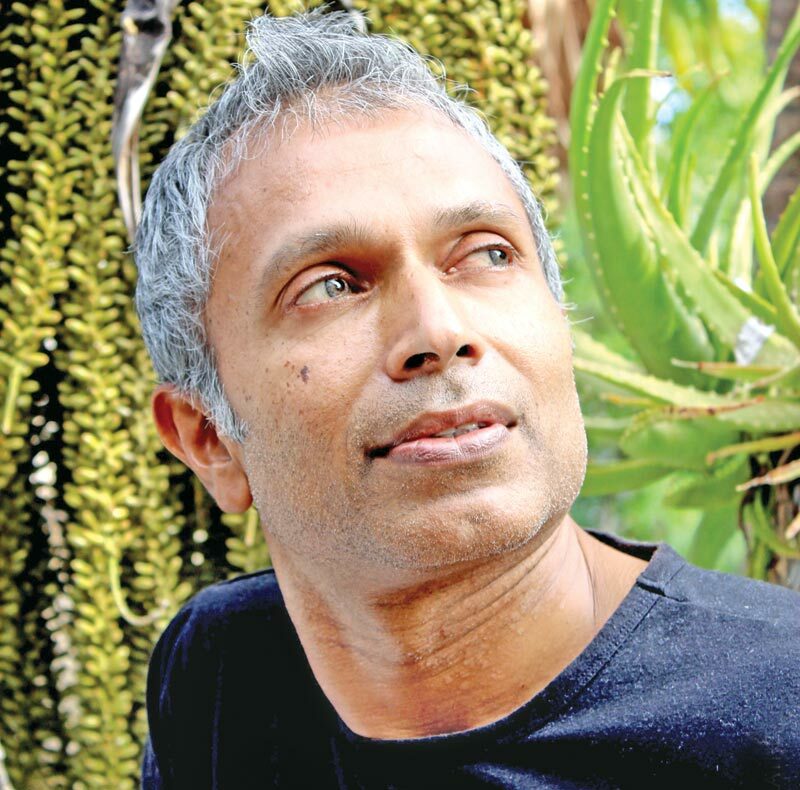 You are one of Sri Lanka’s finest authors. How did you develop this discernment of fine distinctions? A: In a novel you build sentence by sentence and quite often you don’t really know where it is going. You have a pretty good idea in your head where you want the novel to end. But there is a bit of freedom while you are writing it. You have to learn to be able to distinguish and spot oddity and regularity and to see that a certain arrangement is harmonious and another arrangement is not. When I lecture to the students at SLIA I always say that all art is underpinned by music. There is a rhythm to all creation. If you look at a house, the rhythm is the arrangement of darkness and light. A window might be dark, the space between the two windows might be light. That gives a certain rhythm to architecture. Likewise in a novel or a piece of writing there is a certain music. You have to be alive to it. Some authors have it and some authors don’t. Quite often the best authors do and it is hidden. You have to train your ear to pick up the rhythm in the author’s work. You as the reader need to develop your ear to pick it up. It is the same as developing an ear to appreciate music. Music is music and yet you have to learn to distinguish the beauty of the arrangement. If you are alive to those distinctions and alive to that kind of pattern. It develops a sense of aesthetics in you. Q: Who are the authors you admire most in the world and why do you admire them? A: They are Graham Greene, Evelyn Waugh, Muriel Spark and R.K. Narayan. All of them are very funny. Graham Greene I love, because all his books are to do with good and evil. They are about people who through no fault of their own end up in a world where they are forced to make decisions and are forced to pull a gun out and shoot. He deals with the ethics and the morality of things. He deals a lot with guilt. Evelyn Waugh is supremely funny and satirical and yet there is an underlying pathos and sadness. Muriel Spark is absurd and her characters are so weird. I empathize because some of my characters are somewhat weird. And R.K. Narayan is such a funny observer of life. Surely if you like a writer’s work twenty years ago you will still like it now? I have been told that R.K. Narayan is completely out of fashion now! But I love his style because his words are very simple. It is a deceptive simplicity. Q: What is your formula in life for success? What are the guidelines you can give to a youngster trying to come up in life? A: You have to be slightly schizophrenic about this. You have to be two people. And quite often it is difficult to be two people. On the one hand you have to be open to that artistic side that we all have. Sri Lankans are hugely artistic. That is the reason why we have so many mental problems here and there is a high rate of suicide. You have to be open to that artistic side of you. Give it a go, give it free reign and allow it to flourish. But at the same time you have to pay your bills. So you have to get yourself a decent job. The trick is to be able to manage both. In my case I worked really hard from the age of 20 to 30 years. So hard you would not imagine. I didn’t go out a single night and I worked Saturday’s and Sunday’s as a builder in London and I was successful. By the time I came back here. I told myself that now I could allow myself a bit of freedom. I continued working but allowed myself more freedom. You need to have this quality of working hard, setting yourself certain deadlines and set yourself targets. In the meantime you must not give up that artistic side. You can make a conscious decision to bury it for three years and bring it out later. That is possible because I have done it. In those ten years as a builder I did not read a single book. I did not write a single word. That is why I find it easy to write books now. Because I didn’t write anything then. In many ways that is a very good thing rather than starting to write at the age of 18. Because at the age of 18 what do you honestly know about life? You have to have a certain insight when you are a writer. The readers want some wisdom in addition to the story. But the bad thing is after burying it, you don’t come back to it. There is a risk of that as well. All the money in the world is useless if you do not have the soul to appreciate. It is never too late. I started writing when I was 42!